Americans seem to be divided on the importance of raising the U.S. debt ceiling. Regardless of your personal politics, avoid investing in countries that cavalierly allow their debt and deficit to balloon. A year ago I wrote the column “Avoid the ‘Ring-of-Fire’ Countries” that suggested readers should underweight investments in countries with a high debt and deficit and low economic freedom. That recommendation has proven brilliant. Given the dangers of worldwide sovereign debt, this may be one time when investors should continue to tilt foreign and toward specific countries. Bill Gross, cofounder of the Pacific Investment Management Company (PIMCO) and the country’s most prominent bond expert, coined the term “ring of fire” to highlight the dangers associated with countries with high debt and deficit. The eight countries he identified were Japan, Italy, Greece, France, the United States, the United Kingdom, Ireland and Spain. Our predictions were accurate. GDP growth is at a sluggish pace of 1.8%, and even officially, unemployment remains at 8.7%. We also suggested “lightening up on foreign investments that primarily just follow the MSCI EAFE index.” EAFE stands for Europe, Australasia and the Far East. It represents all the developed countries outside of the United States and Canada. This includes large investments in all seven of the non-U.S. ring-of-fire countries. The EAFE consists of 22% Japan, 21% United Kingdom, 10% France, 4% Spain, 3% Italy and 1% Ireland and Greece. In total, 61% of the EAFE index is invested in ring-of-fire countries. This past year was a dynamite period for the markets. The MSCI Net EAFE return through the end of last month was 30.7%. 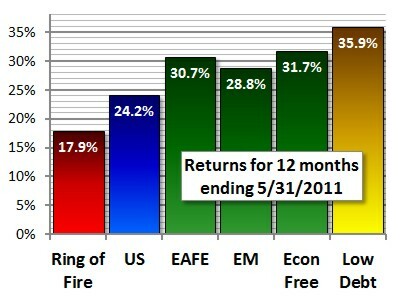 The seven countries in Bill Gross’s ring of fire, however, averaged only 17.9%. When weighted according to their share of the EAFE index, they performed a slightly better 21.7%, pulled up by the United Kingdom and France. Underperforming the EAFE index by a weighted average of 9% is a poor return comparison against the benchmark. The United States, now well in the ring of fire, earned 24.2% by comparison. I advised investing more in emerging markets. They returned 28.8%, beating the United States and the ring-of-fire countries. I also recommended emphasizing countries with economic freedom such as Hong Kong, Singapore, Australia, Switzerland and Canada. These five countries beat the EAFE index, averaging 31.7%. And I suggested overweighting mostly free countries with lower debt such as Denmark, The Netherlands, Finland, Sweden, Austria, Germany or even Norway. These seven countries did the best, averaging 35.9%. Investing in countries with economic freedom continues to provide gains since I first mentioned it in a column in 2004. Underweighting countries with high debt and deficit is another important screen. Last week I wrote about the advantages of a gone-fishing portfolio. My biggest worry with such a portfolio is that for simplicity’s sake it invests heavily in the EAFE index. But the global sovereign debt crisis will likely continue for another decade and drag the returns of many countries. My first adjustment to a gone-fishing portfolio would be to replace much of the EAFE index with countries with higher economic freedom and a lower debt and deficit. Such a change adds a great deal of complexity, but the additional returns are probably worth the headache of more holdings. These countries should outperform their debt-laden counterparts.